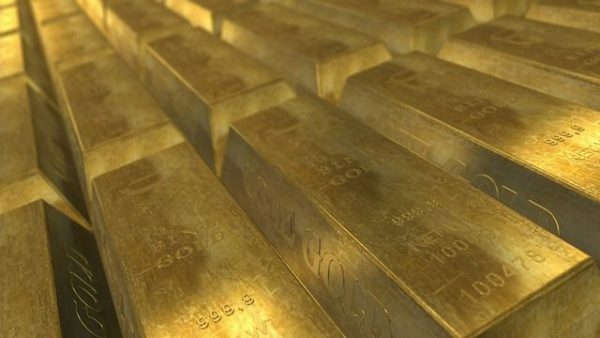 The golden rule of building wealth is simple. It’s so simple, it’s been repeated ad infinitum by the personal finance community, financial planners, and people who actually have wealth. It’s been systematically attacked, hacked, subjugated, by practically every other entity in our society. Ready? Here it is: spend less than you earn. Oh, and we can’t forget the corollary: invest the difference. Oh, if only, dear reader. If only it were that simple. If only I hadn’t felt dread course up and down my body yesterday as I calculated how much we’ve gone over budget in March. If only Payday Loan Centers didn’t sprout like fire ants across the small rural communities of this country. If only we didn’t have the hear the siren call of advertisements fill our every waking moment, to peruse the endless streams of social media promising you’ll be better, faster, and stronger, if you click here and buy it now. Spending less than you earn, as simple as it sounds, is one of the hardest things to do as a human being living in our modern (especially first world) society. It involves saying “no” one hundred, one thousand, ten thousand times per day to what can feel like everyone and everything around you. It involves staying true to a distant goal for a distant self, living like you’re in a different economic class, developing copious amounts of will power over time, and not letting it all fall apart if your life becomes unglued, through death, divorce, or some other tragedy. It sometimes feels like an impossible task. And yet, people accumulate wealth every day. People save; people retire; they pay off their mortgages. 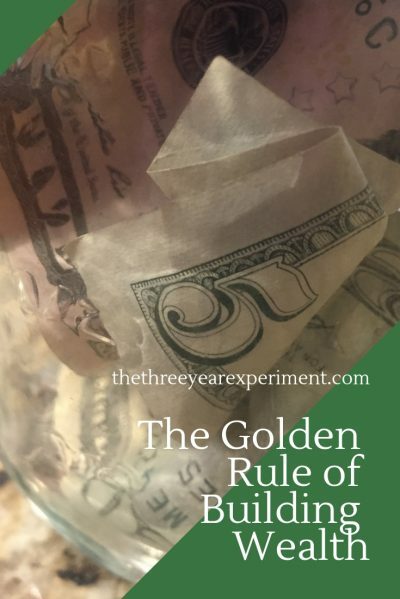 In my experience, as a reformed spend-a-holic, we’ve been able to slowly accumulate wealth in the face of all these temptations because of a couple of behaviors that have allowed us to practice “The Golden Rule of Building Wealth” while still existing in a consumerist society. Almost all of these practices have involved changing our circumstances so that we change our behavior. Yes, that means we’ve effectively tricked ourselves into saving. But that is what has worked for us. Because, as my budget-adjusting has once again proved, spending less than we earn does not come naturally. I’ve written about this before, and I’m sure I’ll write about it again. We have tricked ourselves into spending less by that age-old trick, taking it off the top. We’ve saved money in our retirement plans since our first years working, in Chile (which we’ll be able to access at some point, if we retire there) and in the US. We stopped our contributions while we were paying off debt, but then began maxing out Mr. ThreeYear’s 401K as soon as we could. We did this by contributing 7% at first, then increasing our savings rate each time he got a raise, until he was maxed out. Since I’ve been working part time for the last several years, I’ve been contributing haphazardly to my i401K, but have still contributed substantially each year I worked. Our contribution rates are a case in point. Mr. ThreeYear’s contributions are taken out of his pay check automatically; we don’t think about that money because it’s not part of his pay. I have to contribute to my i401K after I get paid. For the last several years, there’s been no automatic paycheck deposit since I’ve worked as a contractor, and so my contributions have not been as automatic or faithful. If you automatize your contributions to retirement, savings, or paying off debt, and make sure that money comes out of your paycheck quickly, before you get a chance to think about how to spend it otherwise, then you’ll have more success at tricking yourself into adopting an artificially austere lifestyle. This behavior has two parts–one, the specific house that you buy, and two, the neighborhood you buy it in. When we bought our house in New Hampshire, we did an excellent job of being careful on both fronts. Our house was a short sale, and we got a beautiful home well within our budget. We were able to take out a 15-year mortgage and keep our housing expenses to less than 25% of our take-home pay. Our neighborhood was also a good choice. We lived in a neighborhood of well-built homes, with neighbors who took care of them and tended to be friendly (as friendly as New Hampshirites can be) and also, often, incredibly generous. Our across-the-street neighbor plowed BOTH of our driveways for FREE every single winter we lived in that house, and all we offered in return were a couple of bottles of wine at Christmas and a gift card to Home Depot. Our neighbors, being New Englanders, tended to be frugal and weren’t, as a group, showy. They lived below their means, drove practical cars, and did most of their yard work themselves. When we moved to North Carolina, we did a good job on one front, but not the other, and I’m feeling the effects of that poor decision. Pay attention to the house *and* the neighborhood in which you live. We moved into a smaller house in North Carolina (although more expensive than our house in NH) and have enjoyed smaller utility bills for it. I suspect our home will appreciate faster than the national norm, given that we bought in a highly-desirable town with excellent schools. It’s a great house for our family and meets all of our needs. However, we did not do as good a job picking our neighborhood. While we live in an amazing neighborhood, where we’re walking distance to the Greenway, bike trails, pools, and tennis, we live in an affluent neighborhood where people regularly engage in “Keeping Up with the Joneses” on steroids. “Do they give those Lexus SUVs out like candy in this neighborhood?” asked one similarly-frustrated neighbor. When surrounded by neighbors who earn in the top 5%-1% of our rich country’s income scale (with spending habits that likely eat up most of their income), it can be hard to stay the course with your frugal lifestyle and habits. It’s hard to continue to do yard work yourself when the vast majority of your neighbors have a yard crew. You can only hear “Don’t you want to just pay to have someone else do it?” so many times without starting to question yourself. We are social creatures, and we unconsciously adopt those habits of those we spend the most time around. So it’s very important to choose both a home and a neighborhood that is conducive to building wealth–ideally, a neighborhood filled with understated, frugal weirdos. Over the years, Mr. ThreeYear and I have worked hard at becoming really good at our jobs and getting the biggest raises we can. While we used to practice job-hopping to earn more (the practice of leaving a job every two to three years and taking a job with a competitor for the resulting bump in pay), we’ve now settled into jobs with lower pay that bring more life satisfaction (i.e., require less time at work and give more work/life balance and vacation time). Still, we focus on earning as much as we can at said jobs so that we have more to save. 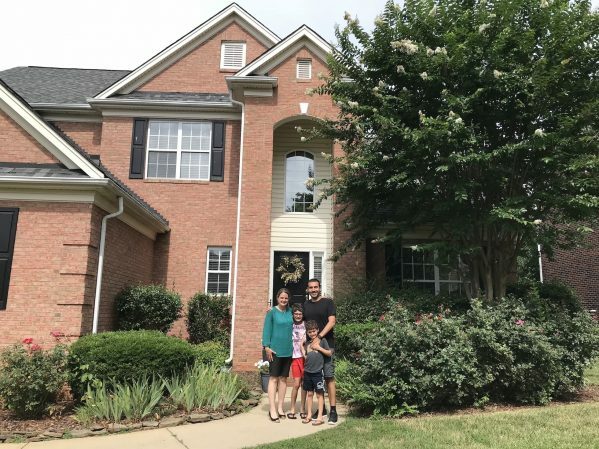 We have noticed that every time we move, which has resulted in a higher-than-previous mortgage payment, we find ways to bump our income up, so that we can have a similar disposable income percentage and similar savings rate. We’ve also systematically paid off our debts so that more of our money can go to savings instead of debt payoff. 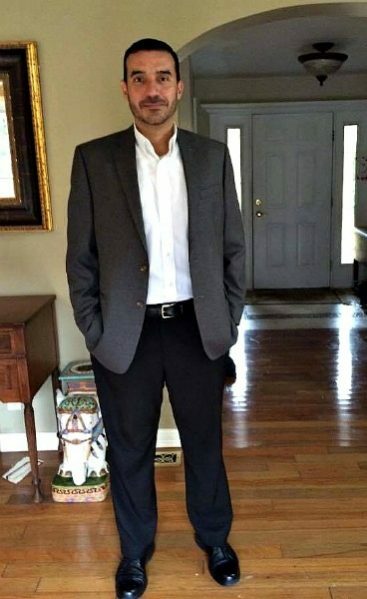 Mr. ThreeYear, ready for another day at the office. When you earn more, it’s very easy to incorporate your new earnings into your budget, and not save the difference. For that reason, we’ve practiced what I call the Bank Your Raise principal for several years. Each time that Mr. ThreeYear gets a raise (as of yet, my jobs have been too part-time to get a steady or noticeable yearly raise), we put the difference in pay into savings. It’s automatic, so we don’t allow ourselves to spend more when we earn more. We’ve used budgeting software since the first months we began to pay off debt. We currently use YNAB and have now gotten a month ahead in our budgeting. It doesn’t always ensure success, but it does help us look realistically at our overspending, and, much like a scale, keep us honest about what we need to do to get back on track. I’ve talked about tracking your spending since the very beginning days of this blog, because even if you’re not a budgeter, tracking your spending gives you useful information that can help you change your spending. We track our spending using an Excel sheet (if you want a copy, get in touch and I’ll send you one). It simply has categories that match our budgeting categories, so I fill those in every several months or so. Yes, it’s a lot of work, but the budgeting software makes it easier. Yes, I could just use the budgeting software’s “Report” feature, but I find that typing the info in makes the information mine, and I don’t have to rely on a third party’s report. I also track some things differently in my budgeting software than the budgeting software does to get my total spending numbers (such as, counting the principal paid down on my mortgage as savings). The cold, hard truth of our spending sometimes smacks us right between the eyes. But I’ve noticed that we’ve made changes based on those numbers over the years, consciously or not. I’ve worked for years to get our grocery spending down, and finally made some headway last year. Our eating out category taunts me regularly, and this year I’ve done some experiments to figure out the best way to spend our money to get the most value in eating out. If you’re not very good at frugality, I suggest finding some friends who can teach you. That’s what I’ve done over the years. When we moved to North Carolina, I looked for people to hang out with who were more frugal. One neighbor asked if I wanted to split tennis lessons with her son, because it was cheaper this way (I mean, in this neighborhood, you take what you can get). They take vacations to national parks, drive sensible cars, and hand us down their used boots. Yes! Another friend confessed that despite a divorce, she’ll be a millionaire soon. When other friends suggest going out to a restaurant, she says, “Let’s go back to my house.” I know why she’ll be a millionaire soon. 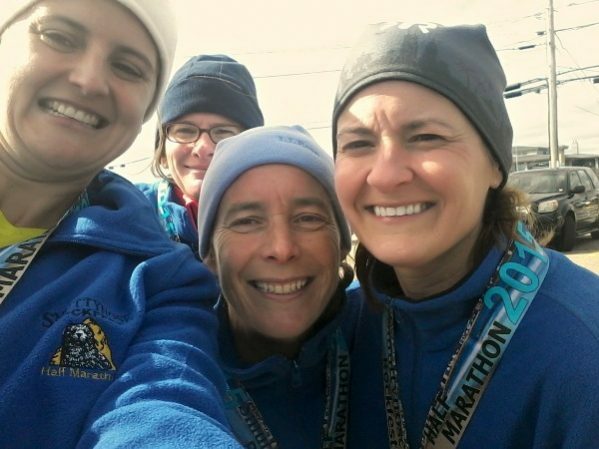 Me and my running friends, eschewing makeup and fancy clothes. The Golden Rule for Building Wealth isn’t directly relatable to the golden rule we all learned as children, “Do unto others as you would have them do unto you,” but if one of your goals of wealth building is to give more, be more generous, and have more time to spend with others, then learning to spend less than you earn and invest the difference is undoubtedly an excellent strategy to employ for becoming a better friend and neighbor. Studies have shown that thinking about and even having more money can lead to less generous behavior, at least in the short term, so that is the beast we all have to wrestle with in the financial independence community. But, mastering overspending and instead investing, rather than paying debt, can lead to wealth that we can use to help other people, start foundations, and solve some of the world’s most pressing health concerns. So we’ll continue to work on both golden rules. How about you? Would you agree that this is the golden rule of building wealth? yep. i also agree that staying put in a house and job has value too and it’s not just monetary. you really gotta be careful who you choose to spend time with. we have some really spendy friends who might say something like “you want to fly to denver and go to the ELO concert with us?” my answer: “no.” i don’t really care if that how they spend their money. it’s theirs after all to do as they choose. but some of this stuff just seems off the chain crazy. Glad to see someone else using YNAB. I am amazed when I see the difference it makes in the progress I have made, in the past 5 years. It is mind boggling. My next goal is to pay off my mortgages, in 10 years, for both my home and an apartment complex, total $674K today. YNAB will help me with this, just as it has helped with building up back up cash. Sounds like you are also making amazing progress. Keeping a separate spread sheet, which brings together all my net worth is also enlightening. I don’t track things like my IRA’s or real estate in YNAB. Every year I am amazed at the progress made, mostly by keeping my expenses as low as possible, and remembering to invest the difference. Wishing you great success in the future. TJ, yes! I feel the same way about YNAB. That is an ambitious goal. Good for you! Sometimes, keeping things simple is wise. I use the backup Excel spreadsheet because I have the time and inclination, but I recognize it’s not for everyone. Good luck to you as well! And man, owning an apartment complex outright–that will be awesome indeed.